The Kaldorei and the Well of Eternity redirects here. Were you looking for the in-game book of this name? The original Well of Eternity during the War of the Ancients. There are two different 永恒之井（Wells of Eternity）. The first Well of Eternity (usually just called the "Well of Eternity" or the "Well") was a lake crafted by the titans that contained immense arcane energy. Described as the fount of Azeroth's arcane lifeblood, the Well accelerated the cycles of growth and rebirth, and before long, it caused sentient beings to evolve from the land's primitive life forms. The Well was located on the ancient continent of Kalimdor near the night elven city of Zin-Azshari. The present area where the first Well of Eternity was located became the Maelstrom after the Great Sundering following the War of the Ancients. The second Well of Eternity was created by Illidan by pouring three vials of water from the original Well into a lake atop Mount Hyjal. It was quickly covered by Nordrassil, the original World Tree. The second Well of Eternity glows with an intense blue radiance and remains pure due to the deep roots of Nordrassil. Zin-Azshari and the Well of Eternity. After defeating the Old Gods, the titans moved and shaped Azeroth for many ages. When at last there was one perfect continent, which they named Kalimdor, the titans crafted a lake of scintillating energies. The lake, which they named the Well of Eternity, was to be the fount of life for the world. Its potent energies would nurture the bones of the world and empower life to take root in the land's rich soil. Ten thousand years before the orcs and humans clashed in their First War, the world of Azeroth cradled only one massive continent, surrounded by the sea. That landmass, known as Kalimdor, was home to a number of disparate races and creatures, all vying for survival amongst the savage elements of the waking world. At the dark continent's center was a mysterious lake of incandescent energies. The lake, which would later be called the Well of Eternity, was the true heart of the world's magic and natural power. Drawing its energies from the infinite Great Dark Beyond, the Well acted as a mystical fount, sending its potent energies out across the world to nourish life in all its wondrous forms. Some legends say that from this magical ether the silithid were born. Besides Zin-Azshari, the cities Suramar and Galhara were also located on its shores. Per the tablets in Quest:The Fall of Ameth'Aran, Ameth'Aran and Bashal'Aran were somehow villages on its shores, even though their ruins are located far from the original location of the Well. In time, a tribe of dark trolls came to settle near the translucent waters of the Well. Over time, the Well's cosmic power affected the tribe, making them wise and immortal. Their skin turned various shades of violet, and they gained a shorter, yet more upright stature. The tribe adopted the name Kaldorei, which meant "children of the stars" in their native tongue. They believed that their moon goddess, Elune, slept within the Well’s shimmering depths during the daylight hours. Later, Sargeras convinced Queen Azshara and the Highborne to create a portal in the Well, leading to the first invasion of the Burning Legion. Following the War of the Ancients, the Well of Eternity was destroyed, and most of Kalimdor with it, leaving only the Maelstrom. However, Illidan had filled seven magical vials with water from the Well of Eternity, and he poured three of the magical vials of water into the lake at the top of Mount Hyjal, creating a new Well. For this insane act, his brother Malfurion and the demigod Cenarius imprisoned him deep beneath Mount Hyjal. The new Well was completely covered by the growth of Nordrassil, its malevolent magics lost with the enchantments of the Aspects. 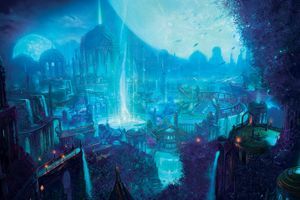 However, Illidan had not emptied all of his vials in creating the second Well of Eternity (which is why the Aspects were able to enchant the World Tree with no interference). Somehow, the Highborne under the leadership of Dath'Remar had acquired one of the remaining vials and, after founding their new homeland of Quel'Thalas, used it to create the Sunwell. At least two of the last three vials somehow found their way back into Illidan's possession, and he gave one each to his lieutenants, Lady Vashj and Kael'thas. They remained in their possession until the Scale of the Sands recruited adventurers to take them back. These vials are now in the hands of Soridormi, prime mate of Nozdormu. 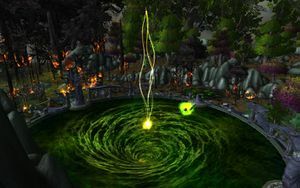 Archimonde's goal during the Third War was to rip Nordrassil off and drain the second Well of Eternity. The Burning Legion was able to destroy most of the Well, leaving behind a crater and puddles, but some of its magical waters yet remain. According to Celestine of the Harvest, as long as at least one drop remains there is still hope. While the Well is harmed, Nordrassil is undamaged. Once, the only way to see Nordrassil and the Well of Eternity was to go through the Caverns of Time and the Hyjal Summit raid instance. Although the Well's waters were once fatal, it then only gave a debuff of Eternal Silence. After leaving the waters the player suffer from Residue of Eternity. After the Cataclysm, players can visit the Well underneath the roots of Nordrassil in Mount Hyjal for themselves. If they dive to the bottom, which is extremely deep, they will find solid rock. Although the original Well of Eternity appears in the titular five-man dungeon, it's portrayed as considerably smaller than in lore, as well as much smaller than the in-game portrayal of the Maelstrom which occupies the exact same space. Speculation about the final vial remnant points to its original host, Illidan Stormrage. It is unknown whether or not he was in possession of it at the time of his death at the former Temple of Karabor, Black Temple. It is also possible (but not certain) that the final vial was used by Illidan during the War of the Ancients, to defend himself against the Abyssal Doombringer in the Well of Eternity instance. The uncertainty stems from a scene where Malfurion sees Illidan with his hand in the Well after the battle, leading to the possibility that he may have refilled it. 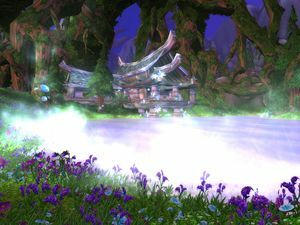 In Mists of Pandaria, Kanrethad notes that the Shrine of Lost Soul's power is very similar to that of the Well of Eternity. It is possible that Illidan used the final vial to power the Shrine. The original Well of Eternity may have had some sort of connection to the Elemental Plane, as the Maelstrom was used by Deathwing to escape from Deepholm. Sharas'dal, Scepter of Tides, made with water from the Well, is described as being made of "living water" and is capable of controlling creatures of the sea such as sea giants and makrura. Coveted by demons, warlocks, and many mages, the well is currently the greatest source of arcane magic in the world. While the World Tree's powers have suppressed the corrupting nature of this magic for centuries, if the tree were ever destroyed, this Well would be the source of unfathomable power to an evil creature powerful enough to wield it. ↑ World of Warcraft: Chronicle Volume 1, pg. ? ?